The history is important because it tells us how things started, and we can easily say that appreciation of jewelry and shiny things started from the very beginning of time. Everything started back in ancient Egypt, where rings were the symbols of intimacy and staying together forever. 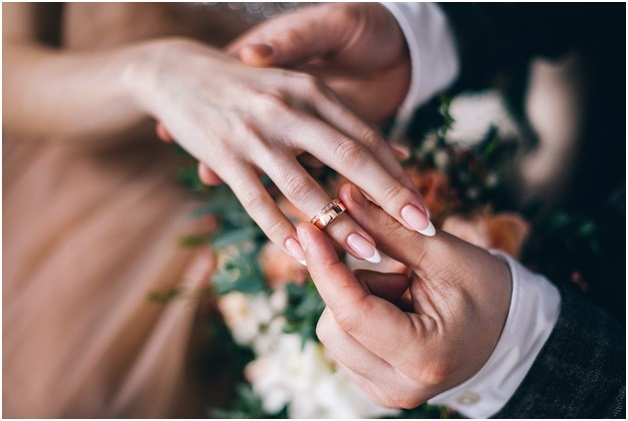 Throughout history, rings were used in business transactions, as personal talismans, course to pledge your love to another and as a symbol of status. This particular story of wedding rings, do not have one path, because it changes based on country’s view on marriage and religion. Some cultures treat rings as legal contracts of marriage, while others consider it as the craft and band that will represent endless love. You should also remember that the changes and shift are not chronological and it doesn’t have an order that we would historically comprehend. Five thousand years ago, ancient Egyptians exchanged rings of love, and that is a first known culture that used this particular idea. Rings were made out of leather or woven reeds in most cases. According to mythology, Egyptians saw the ring circle as one of the most potent symbols that represent eternal love and life, and their symbolic perspective is primary gateways for unknown worlds. Rings were highly regarded especially signets and scarabs. Signet rings were used as a personal signature by Romans and Greeks, and it inspired some of the earliest betrothal rings that appeared in Rome. In Egypt, the rings were sign of devotion, while in Greece they gave them to lovers that featured Eros as the symbol for their love. However, Romans were the one that linked marriage with rings. The most commonly they used five ringsrings that depicted two hands that clasped in agreement and love. These designs could be carved in stone or made in solid gold, similarly as a signet and in most cases, they feature onyx, garnet, aquamarine,and cornelian. Click here if you wish to learn more on wedding rings. As soon as Romans started creating personalized wedding rings, they decided to shift from fede carvings to ones that represented couples themselves. That particular idea carried over to the middle Ages in Byzantine Empire, when most rings feature carved faces of the couple. When Christianity became the official religion, the couple was depicted with cross or Jesus between them, as the idea to get God's blessing for love and marriage. Fede rings featured different styles and shapes, and their popularity increased in Europe for more than thousand years. They entered the market in the 12thcentury and lasted for years afterward. As time went by, they became much more intricate,and jewelers started implementing interlocking bands as well as bright enameling even though people are commonly wearing Irish Cladding ring, where two hands are holding the heart with a crown. This particular design entered the market in the 16th century, 13 centuries after the original fede rings were invented in Rome. A Posy is a short verse from a poem that you can inscribe on a ring, and they entered the general population in the 15th century. From the very beginning, they featured bold designs as well as words that were outside of the bands. As time went by, designs became more straightforward and inspirations much more personal than before. Check this link: https://www.wikihow.com/Buy-a-Wedding-Ring to learn more on how to purchase an appropriate wedding ring. That forced jewelers and goldsmiths to advance their techniques so that they can learn to engrave on the inside of the rings to keep the message closer to the wearer and more private. This particular change in style created a shift from the idea that marriage is clear agreement and contract between two sides and families, to the perspective that unions should be found in love, and should contain personal messages that lovers wish to share with each other. Even today, the idea of a message on the insides of the wedding bands is favorite thing to do,and most of them want to make sure that everything is perfect and not oversimplified with only a band. Therefore, by knowing the history of bands, you will understand it’s symbolic and significance as well.